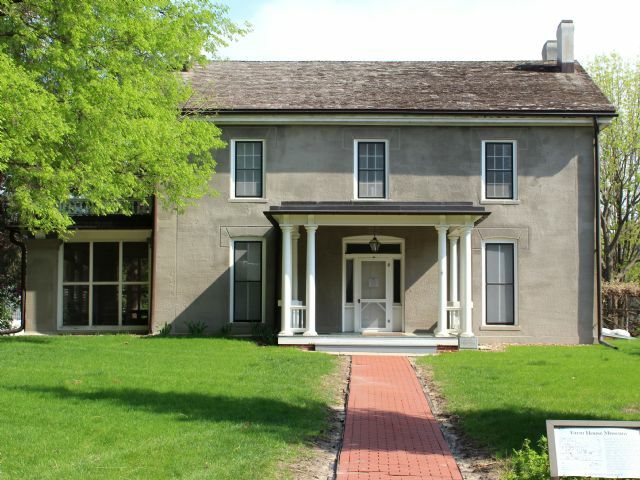 The Farm House, also known as the Knapp-Wilson House, was built in 1860 and completed in 1865. The architect was Milens Burn of Muscatine and the house was built using day labor only -- save the brick work. In 1886, an addition was put on the house in order for two families to live there. The Farm House was connected to a sewer line in 1896, as well as adding a furnace. In 1871, more modifications were made to make the kitchen larger and to fix up some other rooms in the house. Rats and deterioration plagued the Farm House for many years -- the roof needing a major repair about every four to five years. However, the building was reported to be improved greatly with multiple coats of paint. 1910 brought about more extensive repairs for the house and in 1926 a garage was added. In 1965 the Farm House was declared a Registered National Historic Landmark by the National Park Service of the U.S. Department of Interior. Thus, major renovation took place between 1972-1975, after it was decided that the house would no longer serve as offices, classrooms or residences. The Farm House was recreated to look as if it did/would around 1910 and was later named the "Farm House Museum."